Obsidian Entertainment have mentioned the current status of The Wheel of Time RPG in an interview with CVG. To recap: four years ago Obsidian signed a deal with Red Eagle (the WoT media rights-holders) to make a computer roleplaying game based on The Wheel of Time. Obsidian are probably the strongest CRPG company in the business when it comes to narrative and characterisation, so this was a major coup. Unfortunately, Red Eagle were unable to find the necessary funding for the game. Whilst Obsidian as recently as a few months ago were saying they'd still be up for making the game if the money came through, this new statement suggests they are drawing a line under the project. Has there been any movement on the Wheel of Time license? What happened there is that there is a company called Red Eagle, and they have licensed some of the Wheel of Time stuff. I think they're working on a movie, they do comic books, and they also have the game rights. So they talked to us four or five years ago and we put an agreement together to say that, if the funding comes through, we have an agreement to make the game with them. Unfortunately for them, they were never able to acquire the funding. So all the agreements kind of went away. So there's really no connection any more between us and Red Eagle as it relates to the Wheel of Time stuff. But I think Brandon Sanderson is an awesome author, the guy who took over for [late Wheel of Time author] Robert Jordan. I read all his stuff and it's super cool. Sad news, as an Obsidian-made Wheel of Time game would likely be very good. However, I've also heard on the grapevine that Red Eagle's WoT media rights may actually be close to reverting to the Jordan Estate. If this is so, then hopefully we can see more WoT projects getting off the ground in the future once other people are involved. Whether this involves the movie and TV rights, which Red Eagle licensed onwards to Universal, remains unclear. Miles Vorkosigan, in his guise as Admiral Naismith of the Dendarii Mercenaries, has been captured by the Cetagandans and imprisoned on a remote moon, along with thousands of other POWs. Vorkosigan finds a camp in the grip of chaos, with different groups of prisoners fighting amongst themselves and the strong preying on the weak. He has to somehow unite the prisoners before any breakout can be attempted...which is difficult to do when you have bones that shatter easily and no incentives to use. 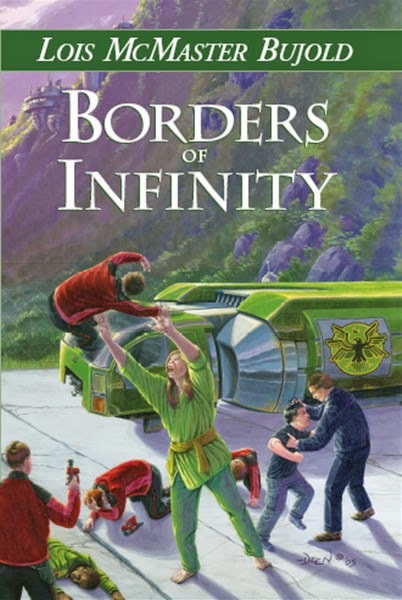 Borders of Infinity is another short novella featuring the character of Miles Vorkosigan, this time back with the Dendarii (after a break of several stories and books, in chronological order anyway) before being imprisoned by the Cetagandans. It's a fairly straightforward and entertaining story, basically involving Miles trying to set up a prison break but being confronted by problems with asserting his authority and making enemies who want to kill him, even if it means they never escape. The story's slightness works against it, as does a muddled tone. Funny scenes - Miles being forced to walk around naked and working with a crazy religious nut to try to win over the soldiers - are contrasted against some of the darker and more brutal scenes that Bujold has written to date. Making such a juxtaposition work is possible, but Bujold fails to achieve it here. There's also the problem of the story being bigger than its word count. The story could easily have been twice as long, but just as it's getting started it abruptly ends, and in a rather straightforward manner as well (although the fallout does at least get novel-length coverage, in Brothers in Arms). Borders of Infinity (***) is readable and passes the time, but is again a fairly short and slight story that feels like it's a novel that's been truncated almost to the point of non-existence. A story that's more important for what it does (setting up Brothers in Arms) than what it is, then. It can be found in the Miles Errant omnibus (UK, USA). Two years have passed since the Battle for New York and the Avengers have scattered back to their own lives. The exception is Captain Steve Rogers, who remains working for the intelligence and security agency SHIELD. Rogers is uneasy with the murky world of espionage and counter-terrorism, preferring the old days of fighting Nazis and HYDRA agents. When a mysterious assassin known as the Winter Soldier tries to kill Fury and SHIELD itself looks like having been compromised, Captain America is forced to go on the run and unearth secrets stretching all the way back to WWII. The Winter Soldier is the ninth movie in the Marvel Cinematic Universe and the second to focus on the character of Captain America. It's also the first since The Avengers to focus on SHIELD, Fury and the bigger plot of what's going on in the world now that the existence of aliens, superheroes and other threats is widely known. It also takes a different tack to previous MCU films. A formula of sorts has appeared with these films, with a lot of set-up (usually accompanied by humourous dialogue) culminating in a big CGI slug-fest, usually with a couple of fan-pleasing cameos and movie cross-references. 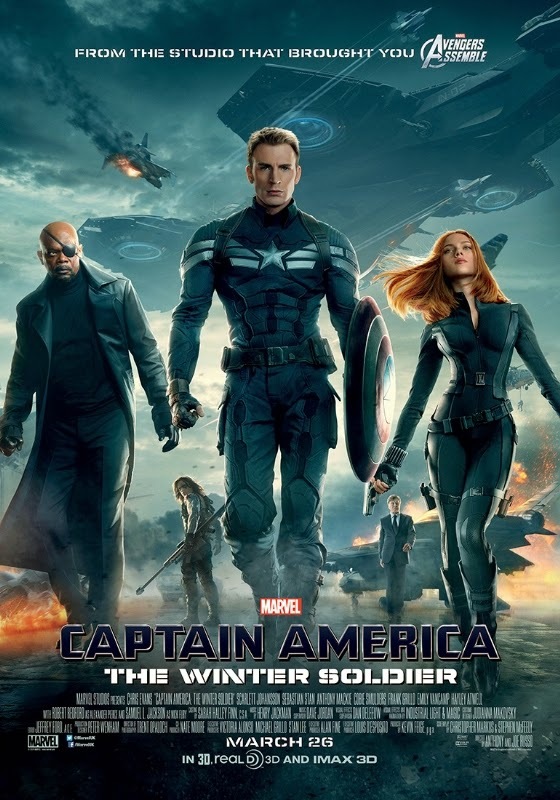 The Winter Soldier doesn't have much truck with this formula, instead creating an atmosphere of mistrust and paranoia throughout the opening of the film as Rogers realises he doesn't know who he can trust. Even the motivations of Black Widow (Scarlett Johansson) appear suspect. Much has been made of the film's nods to 1970s thrillers and its preference for real stunts over CGI, and these do add a lot of weight to the film. It's interesting that one of the most impressive action sequences involves a car chase featuring Nick Fury which relies on real effects and stunt-driving with only marginal use of CGI. The film builds up an atmosphere of murky paranoia and, impressively, shows that whilst Captain America is uncomfortable in this world he is still capable of handling it. A sequence where he, without dialogue, he gradually becomes aware of undercover enemies gathering around him is particularly well-handled in this respect. 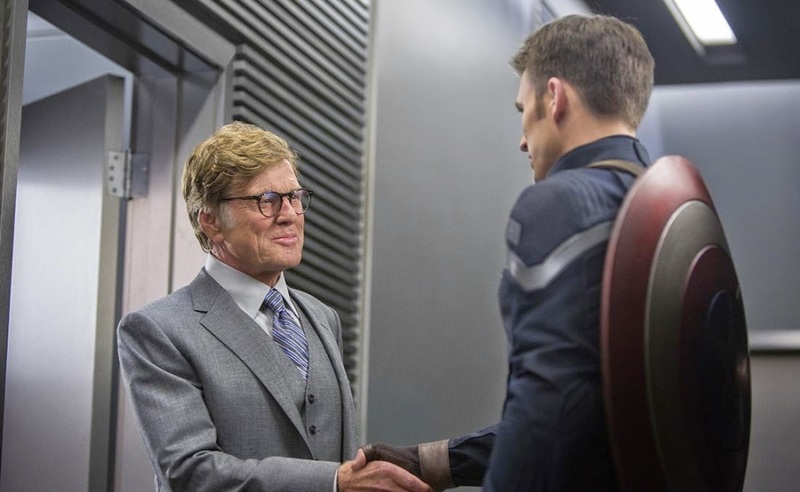 The characterisation for Rogers is nicely-handled by the writers and played with charisma by Chris Evans, improving on his straightforward performances in the first Captain America and The Avengers. Scarlett Johansson and, in his biggest role in the MCU movies to date, Samuel L. Jackson also impress. 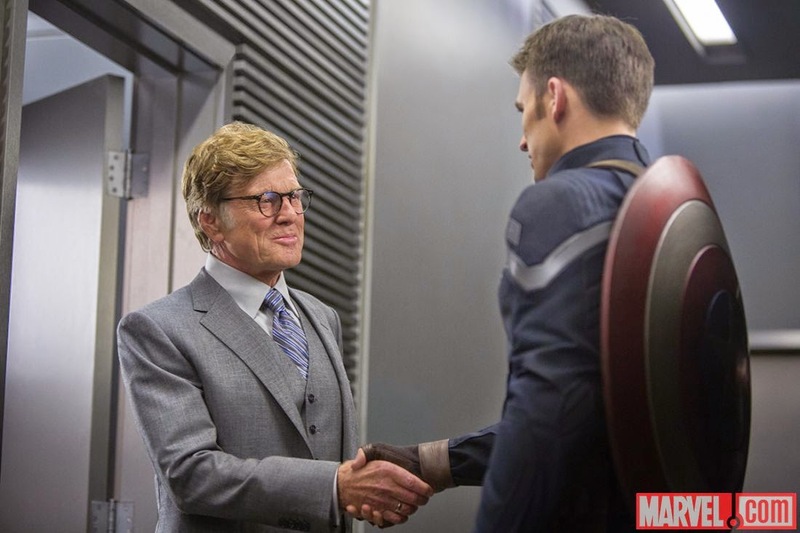 There's also a strong turn from Robert Redford as one of the men in charge of SHIELD's existence. The story is fairly engrossing, benefiting from being (relatively) based around themes of espionage, technology and surveillance. The 'big threat' in the film is fairly straightforward, even mundane, and perfectly understandable (no glowing mystic cubes from beyond time here). There are a few plot twists and surprises that are either predictable or implausible, but for the most part the film stays relatively grounded. There's also a nice line in the bad guys not underestimating Captain America, bringing almost ludicrous amounts of firepower to every attempt to kill him and not believing for a second that he's dead until they see his body. The bad guys are - relatively - fairly smart and more sinister a threat because of that. The film falters a little bit in several areas. First of all, the 'Winter Soldier' storyline is, despite the name of the film, more of a subplot and more of a setup for a sequel than a strongly-defined storyline in this film itself. Several times it feels incongruous in terms of the narrative. There's also the fact that the movie's final act involves a massive aerial battle involving helicarriers, fighter jets, guys in winged suits (an ordinary soldier puts one on and turns into a superhero almost instantly) and huge explosions, where the CGI overload missing from the rest of the movie comes back with a vengeance. The directors hold it together reasonably well, but it does feel like, after a more twisting and interesting narrative, the ending is much more straightforward than it could have been. Captain America: The Winter Soldier (****½) is the least Marvel-like of the MCU films to date and is all the better for it, touching on real-life themes and trying to stay more grounded in (or at least in vague touch with) reality. It's also the best of the Marvel films to date, and even plays a key role in helping the Marvel TV show Agents of SHIELD develop into something more interesting in the last few episodes of its first season. The film is on general release now. 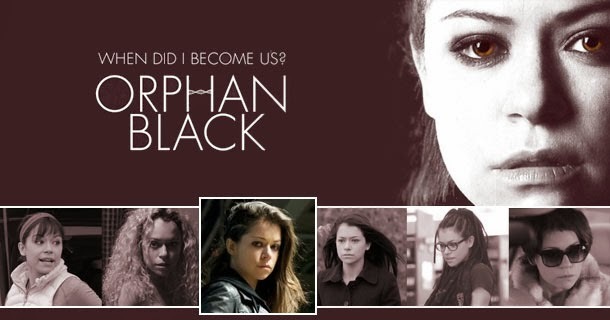 BBC-3 have brought forward the return of Orphan Black in the UK. The show's first season started airing in August last year, but building on the buzz for the second season the BBC will start airing it on 30 April, just a week and a half behind the USA. Some sources are also reporting that BBC-3 will start Season 2 with a double bill, but digital planners are showing just the standard 45-minute slot so far. The move comes after the release of Season 1 on DVD and Blu-Ray was moved up from August to last week. I'll be making my first visit to the USA next weekend (and Canada, though that will consist solely of gazing moodily at Toronto Airport's tarmac for two hours). In my capacity as founder of the Game of Thrones Wiki, I'll be attending the C2E2 convention in Chicago and will be taking part in a fan forum discussion panel on Game of Thrones, with some fellow members of the Wikia network and Kristian 'Hodor' Nairn. 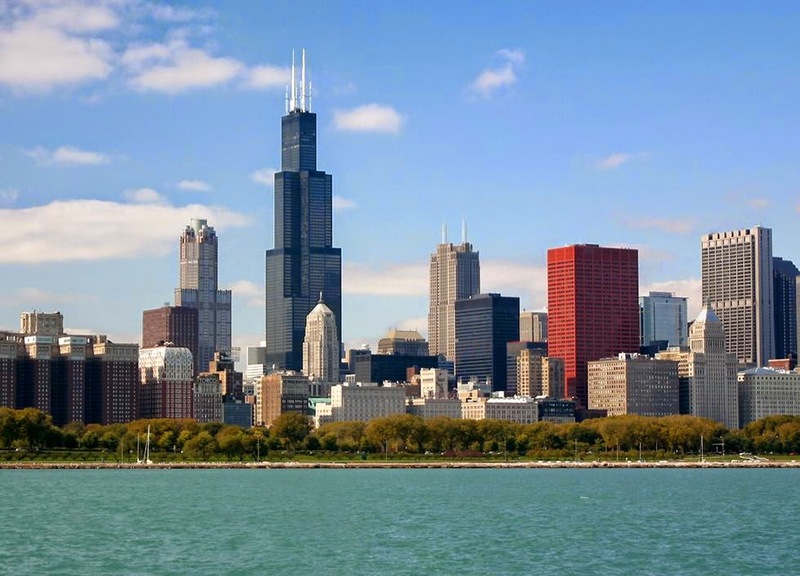 Hopefully I'll have time to see a bit of the city around the con, as it's going to be a flying visit (involving two transatlantic flights in less than 48 hours, which is going to give me some fun jetlag when I get home). And hopefully I'll see some other GoT fans at the event, which should be a lot of fun. It's been revealed (via Amazon) that the third Heart of the World novel by Col Buchanan will be released at the end of this year. The Black Dream will be released in the UK on 11 September, following up on Farlander (2010) and Stands a Shadow (2011). The first two books were released pretty quickly and it's not known why there's been a two-year delay for this volume. It also won't be the last novel in the series, with Buchanan projecting at least a fourth novel and possibly more. 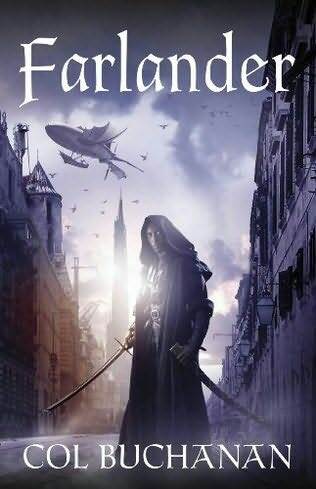 I enjoyed Farlander but have been holding fire on reading the sequel until it was clear that the series would continue. 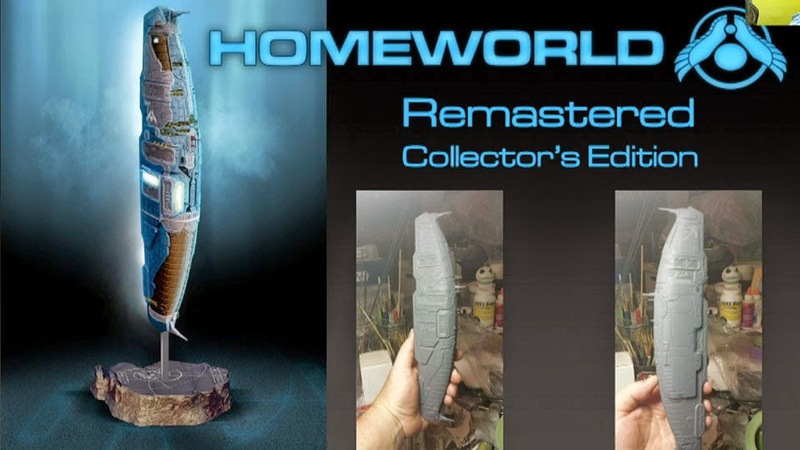 Gearbox have confirmed that the special edition of their forthcoming re-release of the Homeworld games will include a 12" reproduction of the Pride of Hiigara, the Mothership from Homeworld 2. The spacecraft model will, via USB power, light up. On the one hand, this is completely pointless. On the other hand, it also looks kind of cool. What is a little mystifying is why they have gone with the Pride from the second game, when the Mothership from the original Homeworld is regarded as being more iconic. The Gearbox Homeworld forums even show a clear preference for the model to be of the original ship. Homeworld Remastered will be released in the autumn via Steam. George R.R. 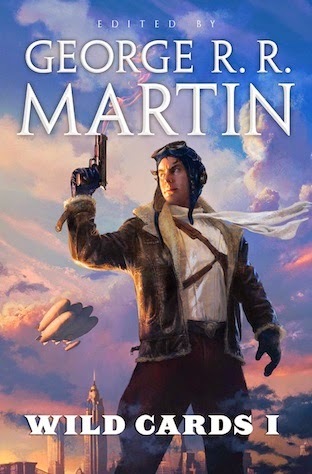 Martin has expanded on the forthcoming omnibus re-release of his three Song of Ice and Fire novellas featuring the adventures of the hedge knight, Ser Duncan the Tall, and his squire Egg. A Knight of the Seven Kingdoms is already available now in several countries, but Martin confirms that the UK and US releases have been delayed so they can be enhanced with artwork. Artist Gary Gianni is working on a substantial number of illustrations which will be added to The Hedge Knight, The Sworn Sword and The Mystery Knight for their omnibus appearance. The book is still expected to appear in late 2015. Martin also clarifies what had been informally known for some time: that HBO do not have the rights to the Dunk 'n' Egg novellas and would have to buy them in a separate deal (the same is true for The Princess and the Queen, The Rogue Prince and historical material like Robert's Rebellion). However, HBO's Game of Thrones rights do include the screen rights to all material set in Westeros, meaning that Dunk 'n' Egg can't be made anywhere else either. Martin does suggest that HBO adapting Dunk 'n' Egg is a possibility, but not for some considerable time. GRRM confirms that the next story remains the so-called She-Wolves of Winterfell, although that won't be the final title, to be followed by The Village Hero, set back in the Riverlands. Neither of these stories will be worked on prior to him delivering The Winds of Winter, however. Firaxis have announced they are developing Civilization: Beyond Earth, the next game in their veteran Civilization series. As well as being a follow-up to Civilization V, the game is a spiritual sequel to Alpha Centauri. Alpha Centauri was Firaxis's first game, released in 1999 after Sid Meier and a group of colleagues had quit Micropose. Unable to use the Civilization licence, they instead developed a very similar (and non-copyright-infringing) strategy game which basically followed up on the question of what happened to the colonists who left Earth at the end of every Civilization game. Firaxis were later reunited with the Civilization licence thanks to Take Two's financial firepower, but in the process lost access to the Alpha Centauri rights (which remain with Electronic Arts). 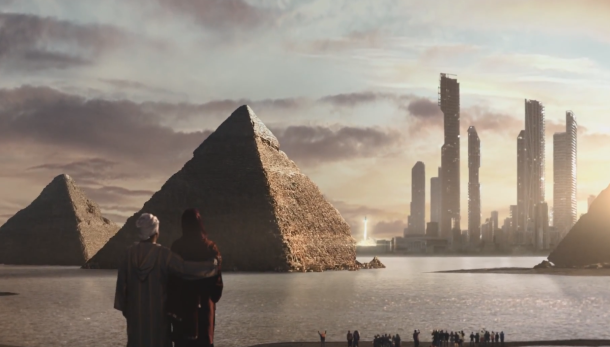 Civilization: Beyond Earth is therefore the official Civilization sequel that Firaxis wanted to make in the first place, just fifteen years later then planned. The game will be a turn-based affair using hexes for movement that will allow players to build up their own civilisation and seize control of planets through diplomatic, economic or military means. The game will be released on PC, Mac and Linux this autumn. An alien species decides to use Earth to test a new bioweapon. An airborne criminal seizes the weapon and tries to use it to blackmail the city of New York. A former WWII flying ace tries to stop him. And, on 15 September 1946, the world is forever changed when the wild card virus is unleashed in the skies over Manhattan. Ninety percent of those infected by the virus die instantly. A further nine percent develop crippling deformities or abnormalities, becoming known as 'jokers'. And one in a hundred of those infected develops a wondrous superpower. They become the 'aces'. As an alternative history of the 20th Century unfolds, the American government first tries to use the aces for their own ends and then, in a paranoid frenzy, turns against them, before they finally win some recognition for themselves. But for the jokers, forced to live in a ghetto in Manhattan, their road to recognition and respect will be much harder. Wild Cards is the first book in the series of the same name, which of this time of writing spans twenty-one volumes with two more planned. This isn't a series of novels, but collections of stories written by many different authors. George R.R. 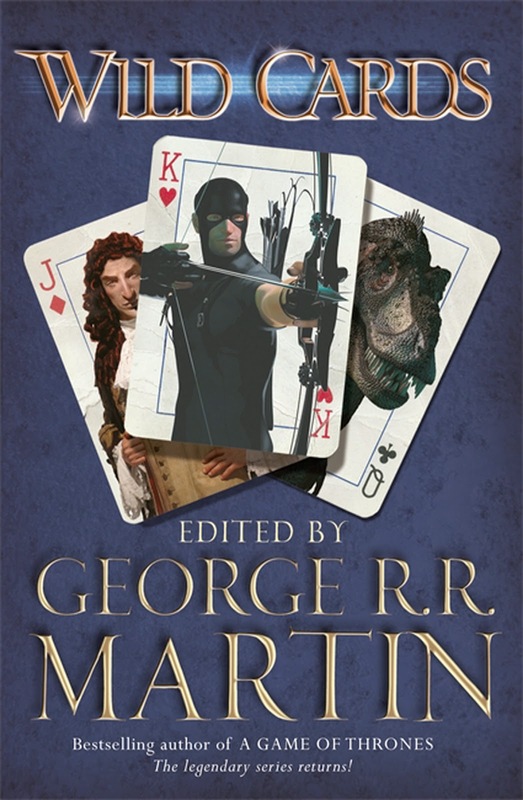 Martin (of A Song of Ice and Fire fame) and Melinda Snodgrass provide editorial control, ensuring that each volume has its own narrative drive and point beyond just collecting random short stories together. The stories are set in their own milieu, with authors sharing ideas, using each other's characters and building up a consistent, coherent shared world. The first Wild Cards book opens with a bang, with Howard Waldrop giving us the origin story for the entire setting in 'Thirty Minutes Over Broadway'. This is a terrific slice of fiction, with Waldrop fusing pulp energy with his own idiosyncratic style to give us something weird, resolutely entertaining and rather tragic in its own right. Roger Zelazny - yes, that one, the author of the Amber series and Lord of Light - then provides the origin story for Croyd Crenson, the Sleeper, one of the original aces whose powers shift every time he goes to sleep. Crenson's periods of hibernation provide a handy way of fast-forwarding through the immediate aftermath of the crisis, showing how New York, the USA and the world adapt to the arrival of the virus. Walter Jon Williams and Melinda Snodgrass then show us two sides of the same tale through 'Witness' and 'Degradation Rites', the story of the Four Aces and their betrayal by the American government. These opening four stories provide a quadruple-whammy of setting up this alternate history and doing so whilst telling stories that are well-written (superbly so in both Waldrop and Zelazny's cases, though the others are not far behind), finely characterised and as gut-wrenchingly unpredictable as anything in the editor's fantasy stories. Later stories remain highly readable, though perhaps not quite on a par with this opening salvo. Martin's own 'Shell Games' is, perhaps unexpectedly, the most uplifting story in the book, the story of the bullied boy who becomes a superhero. Michael Cassut's 'Captain Cathode and the Secret Ace' and David Levine's 'Powers', two new additions for the 2010 edition of the book, are both decent, filling in gaps in the history. Lewis Shiner's 'Long Dark Night of Fortunato' introduces one of the setting's less salubrious characters and makes for effective, if uneasy, reading. Victor Milan's 'Transfigurations' shows how the anti-Vietnam rallies of the late 1960s and early 1970s are changed by the presence of the wild card virus (and gives us an ace-on-ace rumble that is particularly impressive). 'Down Deep' by Edward Bryant and Leanne Harper is probably the weirdest story in the collection (which in this collection is saying something), a moody trawl through the underbelly of New York (figurative and literal). It's probably a little bit too weird, with an ending that is risks being unintentionally comical, but is still reasonably effective. Stephen Leigh's 'Strings' and Carrie Vaughn's 'Ghost Girl Takes Manhattan' (the latter being another new addition in this edition) return to the quality of the opening quartet. The former depicts the jokers' battle for civil rights, resulting in riots and chaos in Jokertown and New York that a shadowy figure is manipulating for his own ends. 'Ghost Girl' is a straight-up adventure with the titular character teaming up with Croyd Crenson to find her missing friend. 'Ghost Girl' could be a novel in its own right, with the battling criminal gangs and dodgy drug-taking rock bands providing a canvas that's almost too big for the story, but Vaughn's method of keeping the story under control and resolving it is most effective. Finally, John J. Miller's 'Comes a Hunter', in which a 'nat' sets out to avenge the death of his friend by going up against some criminal aces, is a superbly-written thriller which examines how 'normal' people can stand up against aces and jokers. The book as a whole is excellent, with the stories entwining around real history and changing it in a way that is mostly organic and convincing. There are a few issues with plausibility here - most notably the way no-one seems particularly bothered about the proven existence of an alien race that has just tried to poison the entire planet - but for the most part the writers use the premise to tell stories about the changed history of the USA (from McCarthyism to civil rights to Vietnam) in an intelligent, passionate manner. Wild Cards (*****) introduces the world, setting and many of its memorable characters through a series of well-written, smart stories. There isn't a weak card in the deck, and the best stories (those by Waldrop, Williams, Snodgrass and especially Zelazny) are up there with the best of their original work. The book is available now in the UK and USA. David Benioff and D.B. Weiss have confirmed that they are planning their first project for when Game of Thrones wraps. 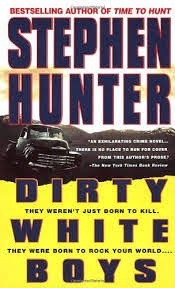 They have made a deal with Fox to write, direct and produce Dirty White Boys, an adaptation of a 1995 novel by Stephen Hunter. Recent statements by Benioff, Weiss and HBO have indicated that Game of Thrones will last for seven seasons, with HBO greenlighting the fifth and sixth seasons earlier this week. At launch events for the series it appeared that eight seasons was briefly back on the table, but Deadline are reporting that seven still seems to be the more likely option. Because of the all-consuming nature of working on GoT (with the writers moving from production to post-production to writing to pre-production without a break), the new film project will have to wait until the series is done. However, the news is a sign that Benioff and Weiss are starting to look at a post-GoT future. 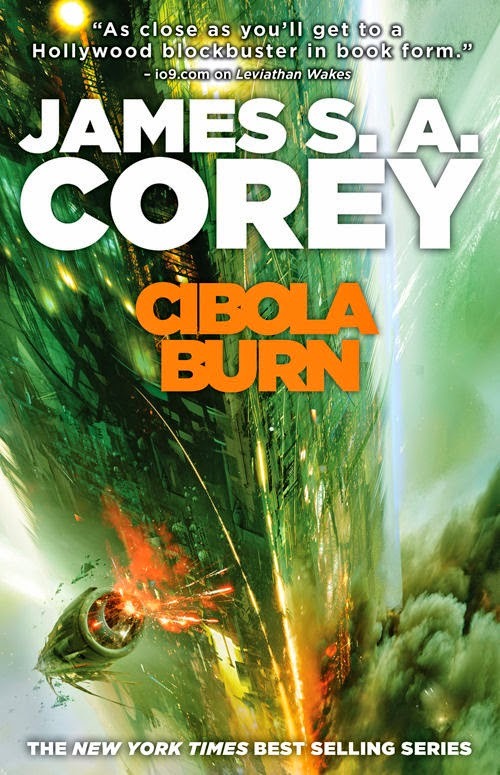 SyFy has greenlit a 10-episode TV series based on James S.A. Corey's Expanse series of SF novels. The Expanse consists of three published novels to date (Leviathan Wakes, Caliban's War and Abaddon's Gate), with the fourth book, Cibola Burn, due in June. There are also several short stories and novellas available in the setting. The author, James S.A. Corey, is a pen-name for fantasy author Daniel Abraham and Ty Franck, whose day is being George R.R. Martin's assistant. Mark Fergus and Hawk Ostby (Children of Men, Iron Man) are attached as writers, executive producers and probably show-runners, with casting and the hiring of directors due to start soon. This is interesting news. SyFy's commitment to returning to proper SF after years of cheesy B-movies and pointless repeats of wrestling is welcome, although so far not exactly paying off: Helix in particular is a dreadful television series. But with the right cast and crew, The Expanse (with its budget-friendly claustrophobic starships and space stations) could be done very well. I'd like to see a more accomplished space opera series on screen, like The Night's Dawn Trilogy, The Revelation Space Series or The Gap Series, but those would all be bigger-budgeted propositions and will probably have to wait until someone with the resources of HBO (or even AMC, Starz or Showtime) decide they want their own big-budget SF series. 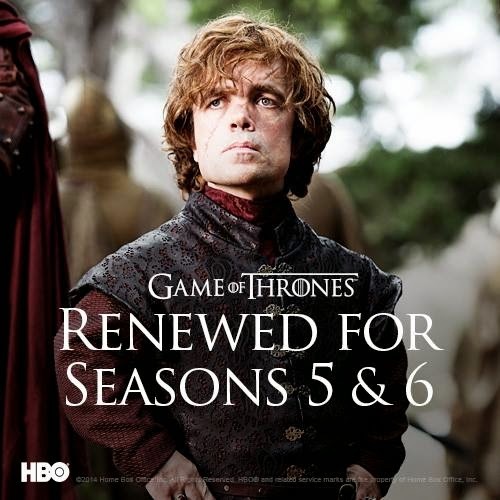 HBO has renewed Game of Thrones for TWO more seasons, carrying the epic fantasy series forwards to a sixth year. Whilst a fifth season was pretty much a done deal, the news that the show would be renewed for two years at once - something HBO has never formally done before for one of its big-budget drama series - came as a surprise. Season 4's debut episode Two Swords, aired to 6.64 million viewers for a first-run audience, setting a new record for the show (triple the figure that tuned in for the first episode three years ago). Including the repeats, more than 8 million people watched on the first night. Consolidated figures, including viewings on HBO Go and further repeats, are expected to take the show up to around 14 million, rivalling the best figures achieved by HBO's biggest domestic hit, The Sopranos (Game of Thrones is already, by a very wide margin, HBO's most popular show ever outside the USA). The fifth season is expected to cover most or all of the fourth and fifth books of the Song of Ice and Fire series, A Feast for Crows and A Dance with Dragons. Season 6 will almost certainly carry the show into material from the as-yet-unpublished sixth novel, The Winds of Winter. Tad Williams has confirmed that his next project will be a new epic fantasy trilogy which serves as a direct sequel to his Memory, Sorrow and Thorn sequence. Memory, Sorrow and Thorn was originally published as a trilogy, consisting of The Dragonbone Chair (1988), Stone of Farewell (1990) and To Green Angel Tower (1993). The final book in the sequence was so huge its paperback edition was issued as two volumes: Siege and Storm. Although traditional in set-up, chronicling a civil war between two brothers for control of the kingdom of Osten Ard whilst a kitchen boy discovers an amazing destiny ahead of him, the trilogy was notable for its mild revisionism, with Williams using a traditional fantasy narrative to chronicle on the shortcomings of the genre. 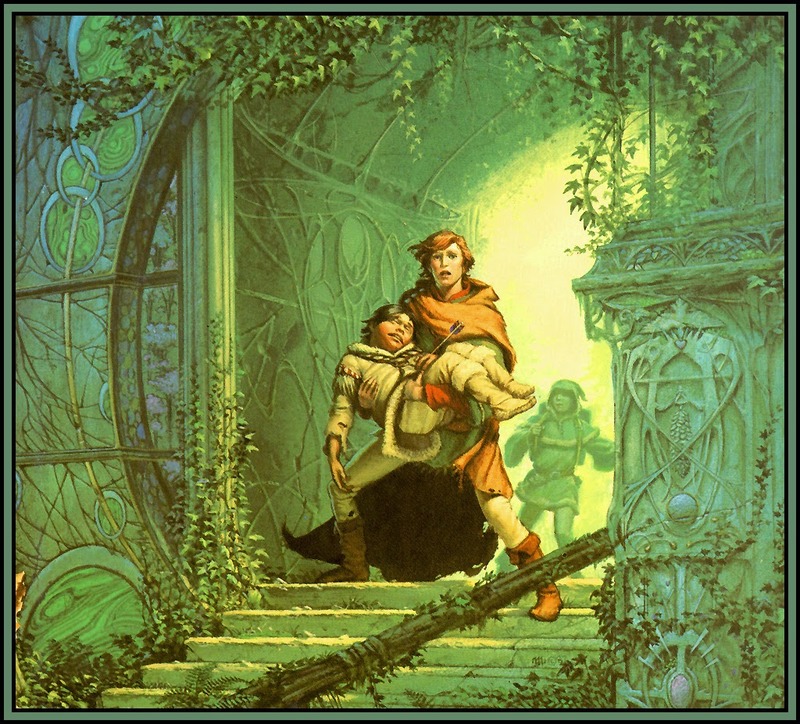 It was also influential in being the first large, Tolkien-esque fantasy aimed explicitly at adults that wasn't completely trying to upend conventions (like earlier works by Donaldson and Cook), and in terms of market and timing paved the way for works like The Wheel of Time and A Song of Ice and Fire. George R.R. Martin is a huge fan of the trilogy and named some very minor characters in ASoIaF after Williams's characters. After years spent working on other works (such as the Shadowmarch quartet, the SF Otherland series, the Dragons of Ordinary Farm series for children and, most recently, the Bobby Dollar urban fantasy trilogy) and occasionally mentioning the possibility of an Osten Ard short story collection, Williams has confirmed that he is returning with a full trilogy of - probably massive - novels. The new trilogy will be called The Last King of Osten Ard and will consist of the tentatively-entitled The Witchwood Crown, Empire of Grass and The Navigator's Children. "I haven’t gone back to my old worlds very often, precisely because I never wanted to be doing so simply to be doing it. (That’s called “franchising” and I don’t like it much, personally.) I always said, “If a story ever comes to me that wants to be written, then yes, I’ll consider it.” And it finally did. In fact, it sprang out of a conversation with wife Deborah Beale late last spring, and it’s been coming together for most of a year now, so we kept it secret pretty long. I believe I can now write a story worthy of those much-loved settings and characters, one that people who haven’t read the originals can enjoy, but which will of course mean more to those who know the original work. More than that, I feel I can do something that will stand up to the best books in our field. I have very high hopes. I’m excited by the challenge. And I’ll do my absolute best to make all the kind responses I’ve already had justified." "In this new trilogy, Williams journeys back to the magical land of Osten Ard and continues the story of beloved characters King Simon and Queen Miriamele, married now for thirty years, and introduces newcomer Prince Morgan, their heir apparent. Also expanded is the story of the twin babies born to Prince Josua and Lady Vorzheva—a birth heralded by prophecy, which has been the subject of feverish fan speculation since the release of To Green Angel Tower in 1993." No release date has been set for the first book, although Williams conceived of the idea a year ago and has been working on the project since handing in the final Bobby Dollar book a few months ago. On that basis, we will likely see the first novel in 2015 or 2016. This is interesting news. I am cautious, as Shadowmarch felt like it steered too close to the ground already laid by Memory, Sorrow and Thorn and felt a little redundant as a result. However, Williams on top form is certainly a strong writer and it will be interesting to see if his new trilogy can make as much of a stir as the original did a quarter of a century ago. Gollancz have confirmed the details of the three novels they are publishing to tie-in with the launch of the new space trading/combat game Elite: Dangerous. Elite: Dangerous is the fourth game in the Elite series, which launched in September 1984 with the eponymous original game. The original Elite was accompanied by The Dark Wheel, a novella written by fantasy author Robert Holdstock (author of the mighty Mythago Wood sequence). Gollancz, Holdstock's publisher when he sadly (and prematurely) passed away in 2009, snapped up the rights to three Elite novels by contributing more than £13,000 to the game's funding campaign on Kickstarter. The game - and the novels - are set at the dawn of the 34th Century. Humanity has expanded across dozens of worlds and star systems in a radius of several hundred light-years from Earth. There are three primary power groups in explored space: the Federation, centred on Earth; the Empire, centred on Achernar; and the Independent Alliance, a banding-together of small powers to resist the strength of the greater ones. Alien life is almost completely unknown, save for a mysterious insectoid species known as the Thargoids. Brutal enemies in Elite, completely missing in Frontier and pacified in First Encounters, it is rumoured that the Thargoids will return in force during the events of Elite: Dangerous. 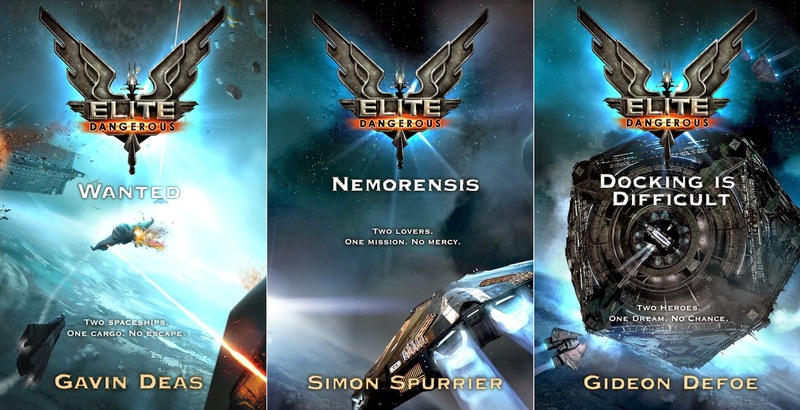 Elite: Wanted is a collaboration between Gavin Smith (author of the splendid Veteran and War in Heaven) and Stephen Deas (author of the Memory of Flames fantasy sequence) featuring a duel between two starship crews. 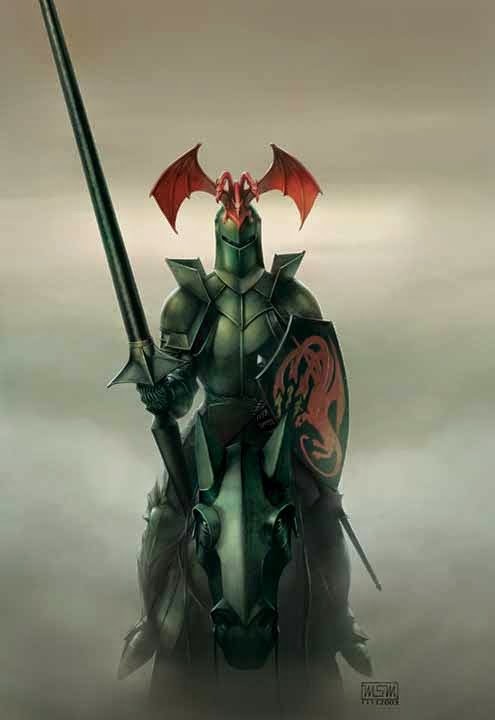 The Song of Stone has a bounty-hunter vessel on their trail, the feared Dragon Queen. The story flips between the two crews as they fight a battle of wits to keep ahead of the enemy. Elite: Nemorensis, by Simon Spurrier (a writer for X-Men comics and the Warhammer franchise), is Bonny and Clyde in space, featuring two lovers who steal a spaceship, go on the run and end up becoming celebrities through the chaos they cause across known space. Elite: Docking is Difficult by Gideon Defoe (the writer of the Oscar-nominated film The Pirates! in an Adventure with Scientists) is a humorous take on life in the 34th Century, in particular the dream of a young man to become 'Elite', the best of the best. Unfortunately, he has to cope with being broke and young first. All three books will be available a e-editions on 15 May. Hardcover editions will be accompany the release of the game later this year. No release date for Elite: Dangerous itself has been set. However, the game is currently being tested online by hundreds of players and it seems well on course for release before the end of this year. 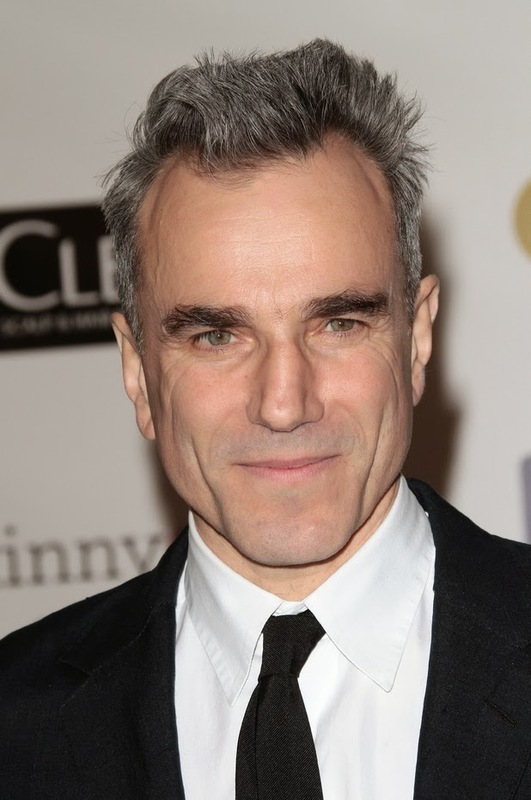 Multi-Oscar-winning actor Daniel Day-Lewis has been cast in Season 5 of Game of Thrones, sources confirmed today. Day-Lewis, shortly before sunning himself on a passing iceberg to get into character. "I was impressed by the depth of character achieved by the writers and wanted to be part of this amazing story," the actor reportedly said. "So I looked in the books to find an upcoming character that I could sink my teeth into. That's why I chose the role of Casso." Casso, King of Seals, is a noble seal encountered on the streets of the Free City of Braavos. He is a seal. "I immediately identified with the inherent nobility of Casso and his internal pain, which I thought I could embody effectively." Casso is still a seal. "We were, of course, delighted," said a clearly baffled David Benioff, executive producer on the show. "I mean, it's Day-Lewis, so of course we were on board. 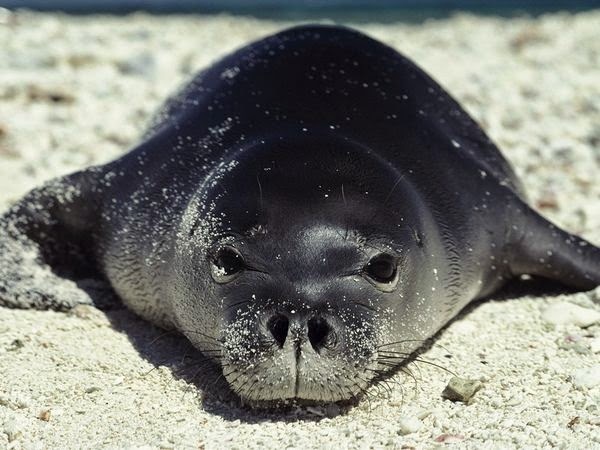 Then he said he wanted to play a seal and we were like, ....okay, I guess." Day-Lewis is already doing his research for the role, spending hours researching the movement of seals and practising their surprisingly varied and subtle array of vocalisations. "He insisted on auditioning," producer Dan Weiss confirmed. "He remained in character throughout, so the interview consisted of him coming in and barking at us in a seal-like fashion for an hour. Clearly, it was the greatest moment of my career, being barked at like a seal by Daniel Day-Lewis whilst he ate raw fish. For ages." "I was excited to hear about the idea," novelist George R.R. Martin commented. "Especially as Casso has some major stuff coming up in The Winds of Winter." When pressed on the rumour that Casso may be the 'Pinniped That Was Promised', Martin chose not to comment. Season 5 has not been formally confirmed yet, but HBO are likely to do so once Season 4 starts airing next week, unless they've decided they don't like money. And sweeping the Emmies next year with Day-Lewis's performance.